Winter Patriot: Holy Cow! Scooter's Gone! Many moons ago, when I was a wee young Patriot, there was nothing I loved better than baseball. How American!! On summer afternoons, if the chores were all done, I would climb a weeping willow tree, with a sandwich, a canteen full of water, and a radio full of baseball. There was a nice little spot up there where you could sit back, stretch out your legs, and relax -- well, I could at the time, anyway. What was I? Ten, twelve years old? What did I weigh? Talk about innocent: what did I know? Just barely enough, really: I knew enough to bring food and water, and I knew where to find baseball on the radio. And baseball, in that part of the country, meant Yankees. And Yankee baseball on the radio meant Phil Rizzuto. My dad still lives in the same house, but he cut down the willow tree ages ago. Said it was too close to the house, the roots were a danger to the foundation. I suppose he's right; he's not the type to cut down a big tree for no reason. Still, I'd have loved to show my sons that spot, and see if they fit into it as well as I did. But they're not old enough for that yet, and they're growing up in a different world; they won't have time for radio, or for baseball. They'll be playing voice-activated video games on their shirt-cuffs, or browsing the net with their pencil cases, or doing half a dozen other things that none of us have even thought of yet. And maybe it's just as well anyway. Because the voice of baseball in that part of the country -- Yankee baseball on the radio -- is gone. Phil Rizzuto, the sure-handed Hall of Fame Yankees shortstop nicknamed the Scooter who extended his Yankee life as a popular, even beloved, broadcaster, punctuating his game calls with birthday wishes to fans and exclamations of “Holy cow!” died Monday night. He was 89. Monday was the 12th anniversary of the death of Rizzuto’s teammate, Mickey Mantle. The cause was pneumonia, his daughter Patricia said yesterday. Rizzuto, who had been in declining health for several years, died at a residential facility in West Orange, N.J. He had lived in Hillside, N.J.
Rizzuto played an integral role on the dynastic Yankees before and after World War II. 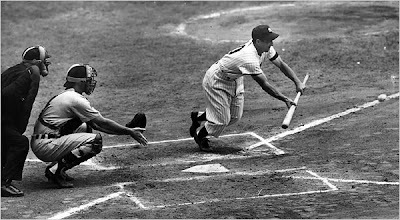 He was a masterly bunter and defensive specialist for teams that steamrolled to 10 American League pennants and won 8 World Series championships, including 5 in a row from 1949 to 1953. Rizzuto was shocked when the Yankees released him in 1956 to sign outfielder Enos Slaughter. But he soon accepted a job in the Yankee radio and TV booth alongside Mel Allen and Red Barber, two towering figures in sportscasting. Despite occasional threats to resign, Rizzuto lasted in the Yankee booth until 1996. Rizzuto’s ramblings and pro-Yankee sentiments maddened detractors. But his fans adored him as they would a delightful uncle, and colleagues were fond of recalling his scorecard notation of W.W. — wasn’t watching. They broke the mold when they made the Scooter. It's too bad. I don't think he was on the same page politically as I am, but how could he be? He was born during WWI, for crying out loud! And I'm quite a few World Series championships short of being able to criticize him as a ballplayer, so I won't say anything about his career average of .273. I loved the story about how the Scooter's voice came to be used in Meatloaf's hit single, "Paradise By The Dashboard Light". Meatloaf was a big baseball fan, a Yankees fan, and he wanted the Scooter on his record. But Rizzuto was nervous: this was rock music, after all, not his style, and he had heard that a lot of rock music fans used drugs. So he wanted to know about this song he was being asked to become part of: Did it encourage listeners to use drugs? "No", he was told, "and in fact, they would probably understand the song better if they didn't!" "OK", said the Scooter. "I'll do it!" Best wishes to all the friends and family of the greatest 150-pound shortstop who ever lived.